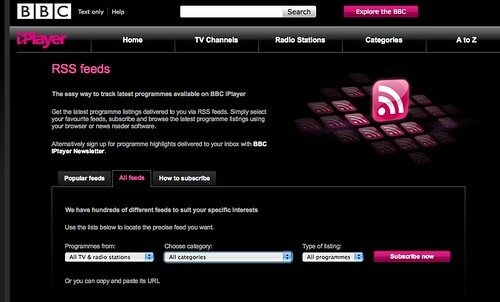 What feeds are available listing upcoming broadcasts of OU/BBC co-produced material or programmes currently available on iPlayer? 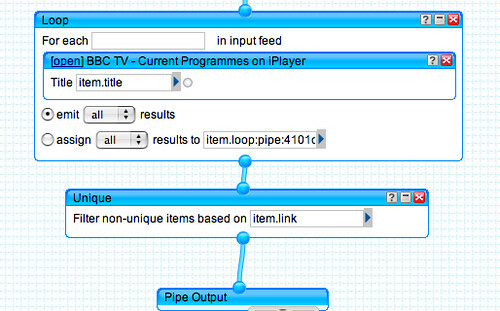 One of the things I’ve been pondering with respect to my OU/BBC programmes currently on iPlayer demo and OU/BBC co-pros upcoming on iPlayer (code) is how to start linking effectively across from programmes to Open University educational resources. Chatting with KMi’s Mathieu d’Aquin a few days ago, he mentioned KMi were looking at ways of automating the creation of relevant semantic linkage that could be used to provide linkage between BBC programmes and OU content and maybe feed into the the BBC’s dynamic semantic publishing workflow. I’m not sure what the guid is? Nor do there seem to be slots for links to related OpenLearn resources other than the top link element? 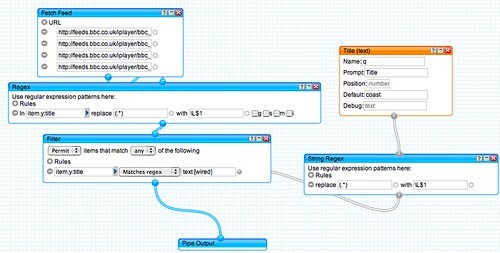 However, the course code does provide a way into course related educational resources via data.open.ac.uk, the nominated academic link may provide a route to associated research interests (for example, via ORO, the OU open research repository), the BBC programme code provides a route in to the BBC programme metadata, and the category tags may provide other linkage somewhere depending on what vocabulary gets used for specifying categories! I’m not sure if plans are similarly afoot to publish BBC programme metadata actual the actual programme instance (“episode”) level? It’s good to see that the OpenLearn What’s On feed has been tidied up little to include title elements, although it’s still tricky to work out what the feed is actually of? It contains an upcoming show date for programmes that will be broadcast over the next week or so, and a link to a related page on OpenLearn for the episode, although no direct information about the BBC programme code for each item to be broadcast. 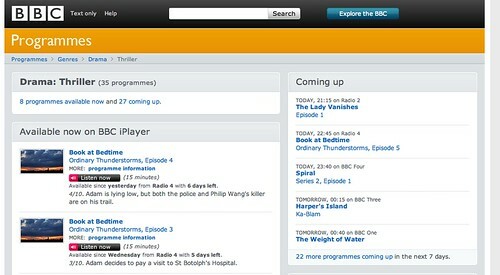 In the meantime, why not see what OU/BBC co-pros are currently available on iPlayer? Or for a bitesize videos, how about this extensive range of clips from OU/BBC co-pros? 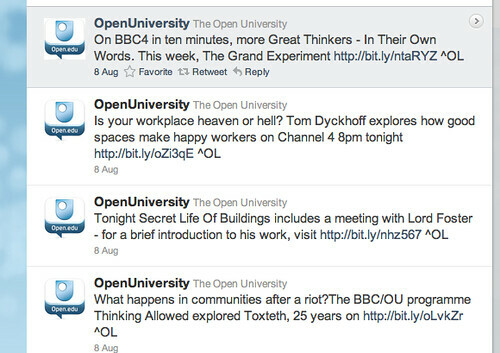 Ever since the Open University was founded, a relationship with the BBC has provided the OU with a route to broadcast through both television and radio. 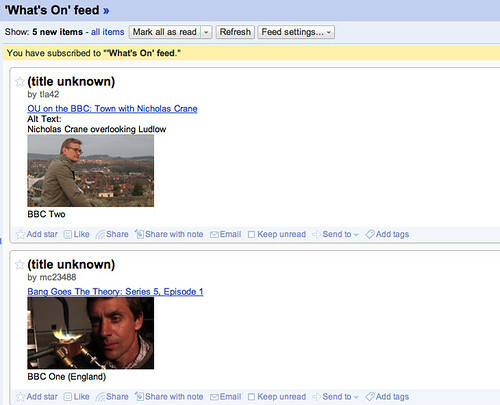 Some time ago, I posted a recipe for generating a page that showed current OU programmes on iPlayer (all rotted now…). Chatting to Liam last night, I started wondering about resurrecting this service, as well as pondering how I could easily begin to build up an archive of programme IDs for OU/BBC co-pros, so that whenever the fancy took me I could go to a current and comprehensive “OU on iPlayer” page and see what OU co-pro’d content was currently available to watch again. The last few weeks have just seemed crazy to me – lots of events, new folk to meet, some incredibly stimulating conversations and a seemingly incessant flow of announcements that might actually mean something coming in over the interwebs. 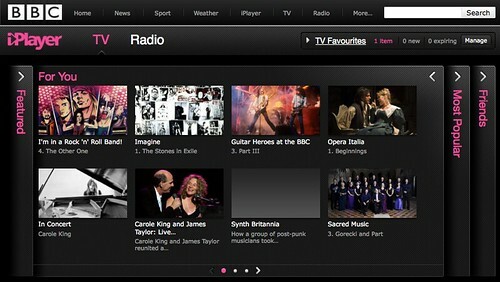 Picking up email as I was leaving the OU last night, I spotted an invite to today’s launch of a reversioned BBC iPLayer. I couldn’t make it down/up to London today, but the press release, #iplayer twitter coverage, live blogs and BBC blogs [UPDATE: another here], as well as the thing itself – http://beta.bbc.co.uk/iplayer/ (or in mobile form, http://beta.bbc.co.uk/mobile/iplayer/) kept me more than entertained. one third iPLayer on Nintendo Wii, (which personally is to say: BBC1, BBC2, BBC3, BBC4 and BBC Parliament). NB my iPlayer on the Wii viewing tends not to be between 8pm and 9.15pm when for whatever reason buffering and dropouts disrupt viewing to such an extent that programmes are pretty much unwatchable. maybe it’s a local bandwidth problem, or maybe it’s a BBC problem…? I think it would be safe to say that if 4oD or the ITV Player were available on the Wii, we’d watch ITV and Channel 4 content on it… Same for Channel 5 (maybe?!). Later in the summer, audiences will also be able to find links to programmes from ITV Player, 4oD, Clic, Demand Five and SeeSaw – as a result of partnership deals with public service broadcasters ITV, Channel 4, S4C and Five, and communications infrastructure and media services company Arqiva. These “metadata partnerships” mean that audiences looking for long-form programmes from other TV services will be directed to their websites: BBC iPlayer will link and drive traffic to them, without any sharing of technology or syndication of content. But that’s for later? What’s for now…? There look to be further personalisation options available in the Categories area (“My Categories”), although I’m not sure how this works…? 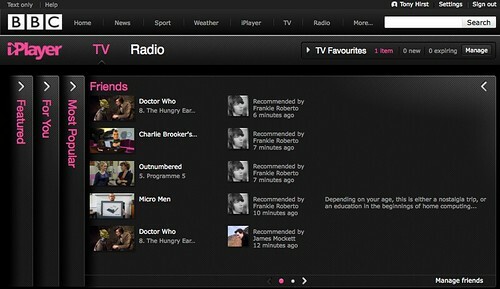 A partnership with Microsoft allows Windows Live Messenger users to log in to their messaging service through BBC iPlayer, enabling them to invite other contacts to watch programmes at the same time and chat live. This is an experimental feature, which will be available in beta later in the Summer; if it proves successful, the BBC plans to extend it to other instant messaging services. That is, users will be able to watch content on-demand, but synched with their remote friends, so they can chat along to it at the same time…. To me, this shouts out a great opportunity to capture programme synched tweets that can be fed into an evolving status updates caption feed (e.g. other Martin’s Twitter powered subtitles for BBC iPlayer, JISC10 Conference Keynotes with Twitter Subtitles or most recently Google I/O 2010 – Keynote Day 2 Android Demo with Twitter Subtitles). I’m not sure I fully grok what being able to watch content in synch with remotes friends actually means. YouTube piloted a feature like this several years ago (Youtube Streams? ), where groups could gather around a video and chat around it, but I think they have since dropped it? (Maybe the timing wasn’t right a couple of years ago?) What this does mean, of course, is that small groups can start to reintroduce concurrent (“locally scheduled”) programming, that we have been moving away from through consumption of personal recordings and on-demand content? Chatting to OU PR guru Paula Feery last week, it struck me that a lot of TV related PR activity (which we go in for at the OU because of our co-pro arrangement with the BBC) is aimed at getting previews of programmes into the press. 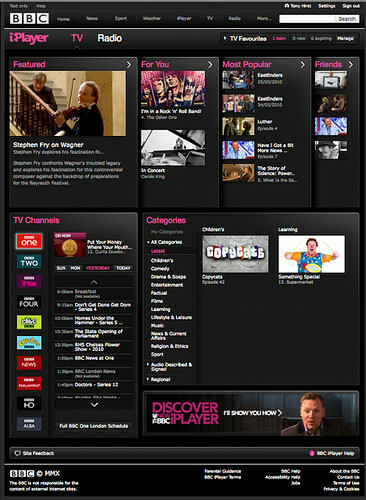 But from my own viewing habits, a large part of my viewing (particularly over iPlayer content) is guided by post hoc reviews appearing in the weekend press of programmes broadcast over the previous seven days, as well as “last week’s” Radio Times, and (occasionally) social media comments from people I follow relating to programmes they have recently watched themselves. From a PR point of view, there may be an increasing benefit in considering “after-TX” PR opportunities to exploit the fact that content remains viewable over a 7 or 28 day period (or even longer for series linked content or content that is rebroadcast on other BBC channels). PPS So much for personalisation…. BBC ID registration requires an age; I set mine to well over 16 but still get this? I can appreciate why, but if this is supposed to be a personalised service….? – Searching the Backchannel – Martin Bean, OU VC, Twitter Captioned at JISC10 (since implemented by @mhawksey). For Martin’s development timeline, see MASHe tt-tweets category. Somewhen last year, I started to explore how we might use a Twitter backchannel as a way of capturing subtitle like commentary for recordings of live presentations (e.g. Twitter Powered Subtitles for Conference Audio/Videos on Youtube, Twitter Powered Youtube Subtitles, Reprise: Anytime Commenting, Easier Twitter Powered Subtitles for Youtube Movies). Further progress toward freestanding subtitles stalled for want of a SMIL like player that could replay timestamped text files. 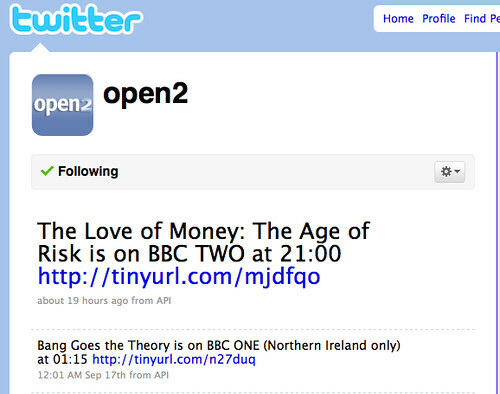 Anyway, whilst I was watching Virtual Revolution over the weekend (and pondering the question of Broadcast Support – Thinking About Virtual Revolution) I started thinking again about replaying twitter streams alongside BBC iPlayer content, and wondering whether this could form part of a content enrichment strategy for OU/BBC co-productions. This builds on my Twitter powered subtitling pattern to create a captions file for downloaded iPlayer content using the W3C Timed Text Authoring Format. A video on the Martin’s post shows the twitter subtitles overlaying the iPlayer content in action. So anyway, the next step is to work out how to make full use of this… any ideas? PS I couldn’t offhand find any iPlayer documentation about captions files, or the content packaging for stuff that gets downloaded to the iPlayer desktop – anyone got a pointer to some? One of the nice things about iPlayer is that there are plenty of RSS feeds available for different sorts of content that is currently on iPlayer. So for example, there are feeds available by channel, by genre, by genre and channel, feeds that contain the most popular programmes, and so on. PPS for howtos regarding the creation of other ‘canned’ DeliTV channels, see Recent BBC/OU TV Programmes on Boxee or UK Soaps on BBC and ITV/STV. Many of you will know that the OU co-produces several BBC television programmes, including Coast and The Money Programme, as well as a wide range of one off series. I could then run the titles from the @open2 feed through the BBC programmes pipe to grab the progamme URIs on iPlayer. So here’s the pipe. 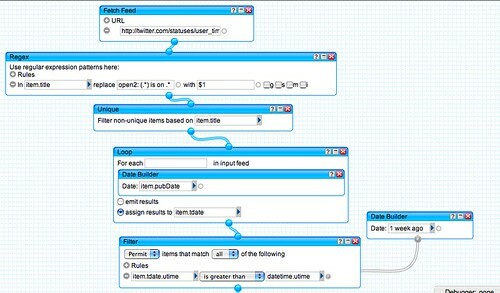 We start by getting the last 50 items from the @open2 updates feed (using ?count=50 to get more than the default number of items from the feed), use a regular expression to parse the tweets to identify the programme titles, remove the duplicate programme title items from the feed using the Unique block, put the time that tweet was sent into a universal/canonical form and then filter by date so we only get tweets from the last 7 days.